Previously unrecognized is the relationship of the James family to Kit Carson. Christopher Houston Carson was born on Tate’s Creek in Madison County, Kentucky. His father Lindsay Carson Sr. was a first generation, American born, of William Carson, immigrant from Ireland. Kit’s father, Lindsay, brought his family to Madison County from South Carolina in 1793. The family followed the Wilderness Trail, forged by Daniel Boone, Johannes Vardeman, & others, to settle on Tate’s Creek. Later, Johannes Vardeman’s son Rev. Jeremiah Vardeman and his father-in-law John M. James joined the Flat Lick Baptist Church with the Tate’s Creek Association. Also living in Madison County at the time of Kit’s youth was Adam Hill, the grandfather of Annie Ralston, who married Frank James. 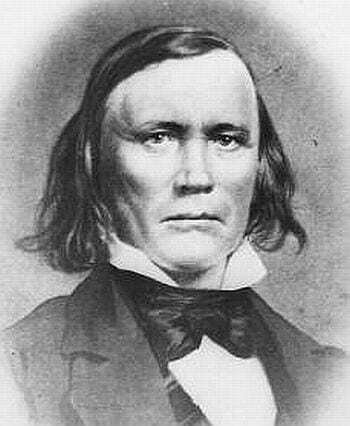 Hill was a blacksmith, but later became a wagoner and guide into the Far West after he migrated with his family to the far western border of Missouri in January of 1834. Lindsay Carson departed Madison County for Missouri in 1811, when Kit was two years old. 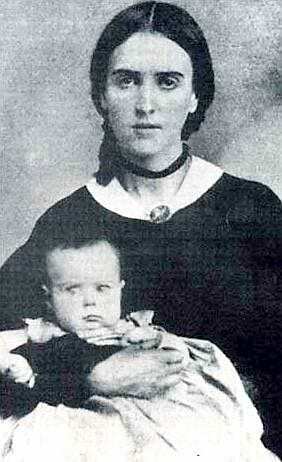 Maria Josepha Jaramillo-Carson with Kit Carson Jr.
Kit’s father did not stay long at Cooper’s Fort in Missouri, before returning to Madison County, where his father was killed by the falling limb of a tree when Kit was nine years old. Kit returned to the West, where at age fourteen he apprenticed as a saddle maker. In 1826, Kit Carson left Missouri for Santa Fe, New Mexico, after which he married, started a family, and wrote himself into the history of the American West. Ransom Carson, a stonemason who rebuilt Flat Lick Baptist Church after the original log church was destroyed in a fire, and who also built the stone house of the “talented, but erratic” Rev. Joseph Martin James, appears not to be a relation of the James, nor of Kit Carson.
. Lindsey Carson Sr. 1754-1818 & Rebecca Robinson 1778-Unk.